Every summer, I am simultaneously excited for and stressed out by the Seattle Public Library and Seattle Arts & Lectures Adult Book Bingo program and Women in Translation Month, which happens in August. These are supposed to be fun efforts to read a lot, and they are fun, and yet I develop anxieties about time. (Ah, time. I am forever losing to time.) In any case, the 2018 book bingo card was recently released, and I eagerly printed out a copy and penciled in my aspirations for the season. Takes Place in the Area You Were Born: 10:04 by Ben Lerner. Lerner will give a talk at Hugo House on August 9, on the novel as a curatorial form. Intriguing! Poetry or Essays (why, why aren’t these separate boxes? ): To Repel Ghosts by Kevin Young, a book of poetry inspired by Jean-Michel Basquiat, which I picked up at the Brooklyn Museum while on book tour. Finish a Book You Started and Put Down: The Omnivore’s Dilemma by Michael Pollan. The second section of this book, on processed food, was dry and slow, and I almost gave up on it. But I am super interested in the section on the rise of organic farming and look forward to the final section on foraging food, the reason I picked up the book in the first place. As I slowly work on a series of lyric essays about food and culture, I am finding Pollan’s research and writing mostly delightful and always informative. I also participated in the Seattle Public Library’s Your Next Five Books program, asking for smart, zippy books by women, ideally in translation. I’ll let you know what they recommend! 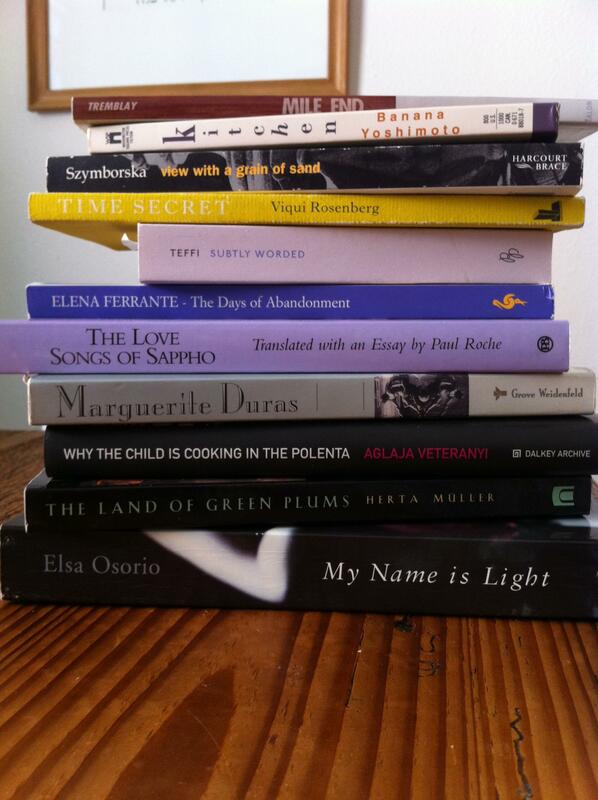 (In the meantime, if you are looking for recommendations from me, here are my previous posts on women in translation.) What are you reading this summer? UPDATE (5/30/18): Here are the five “smart, zippy books by women” that the Seattle Public Library recommended. I am particularly excited about Umami by Lala Jufresa! From the title, to the author’s name, to the promise of a precocious 12-year-old girl protagonist (a soft spot for me), this book will for sure go on my Recommended by a Librarian bingo square. After I read The Land of Green Plums a few years ago, Herta Müller joined a short list of authors whose work I want to read all of. I am not the sort of reader who methodically works through an oeuvre; I crave different voices. But this list includes Virginia Woolf, Toni Morrison, and Mavis Gallant. (It used to include Angela Carter; I adore her short fiction, but actually found trying to read her novels like trying to eat an entire chocolate mousse cake.) Müller’s fiction is poetic and harrowing and sheds light on the country my family comes from. For me, she is a must. The Hunger Angel meditates on objects. Life in a gulag is tedious, so in lieu of a tight narrative arc, the first two-thirds of the book move laterally from things like cement and coal to yellow sand and firs. There’s a weirdly loving chapter about a kind of shovel known as “the heart-shovel,” which, by virtue of its design, allows Leo to forget himself as he works in ways that other tools or tasks don’t. We could choose among marizpan truffles, chocolate cake, savarins, cream cake, nutcake roll, Ischler tartlet, cream puffs, hazelnut crisps, rum cake, napoleons, nougat, and doboschtorte. And ice cream–strawberry ice cream in a silver dish or vanilla ice cream in a glass dish or chocolate ice cream in a porcelain bowl, always with whipped cream. And finally, if we were still able, sour-cherry cake with jelly. As if being in a gulag is not challenging enough, Leo is in the closet. When men and women dance on Saturday nights (who knew they had dances, albeit sad dances, in gulags? ), he remains off to the side. Men and women couple in the barracks; he does not. Though he observes: “Half-starved humans are really neither masculine nor feminine but genderless, like objects.” Over the course of the novel, this meditation on objects also becomes a larger meditation on loneliness and longing and trying to stay alive. Leo has a poet’s eye, and it is that vision, that attention to language, which makes reading this essential book bearable. I’m thrilled to have my essay “Dark Fruit: A Cultural and Personal History of the Plum” appear in the Los Angeles Review of Books today. It collages personal stories with discussions of Tolstoy, Herta Müller, Gregor von Rezzori, ancient Chinese poetry, visual art, horticulture, superstitions, and more. I’m grateful it found a home in such a fine venue! August is Women in Translation Month (WITMonth), designed to encourage readers, reviewers, publishers, and translators to explore more books in translation by women. If you’ve been following the VIDA count, then the grim statistics around women in translation (gathered diligently by Meytal Radzinski) is, unfortunately, not a surprise: women writers comprise only about 30% of books translated into English. As I’m passionate about cultivating a diverse literary ecosystem, this is a project near and dear to my heart. And though I’m happy WITMonth is an annual event, I’m getting started right now. Because there are SO MANY good books and I’m sure there are SO MANY MORE out there waiting to be picked up by a publisher and gobbled by readers. I immediately pulled all the books from my shelves that fit the bill. I made a read pile and a to-be-read pile. Of the read pile, I’d like to make some recommendations, for those of you who’d like to join me in WITMonth. Read these books! And I’ll be diving into the to-be-read pile and writing about the gems in that pile in August. Read those books too! Let’s talk about ’em! 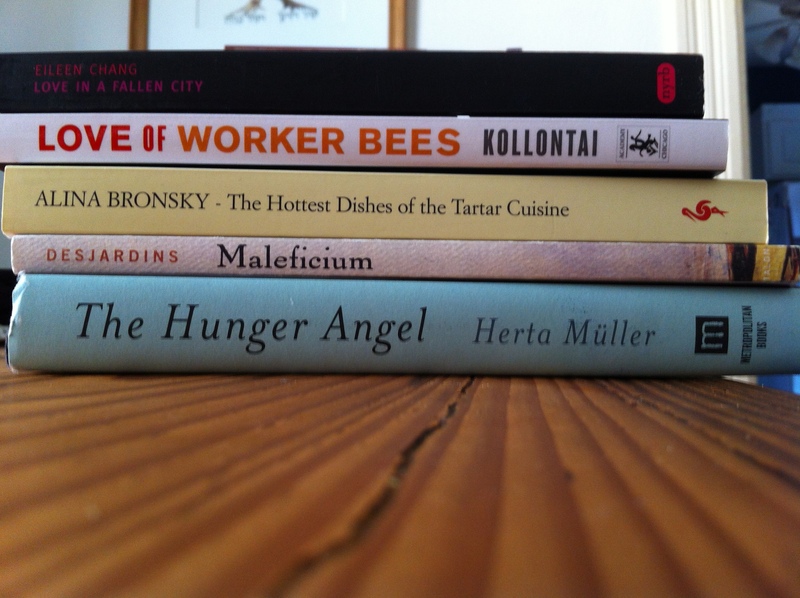 Tasty pile of books in translation. Death in Spring by Mercè Rodoreda, translated from Catalan by Martha Tennent (Open Letter, 2009). A gorgeously written and harrowing novel about cruelty among humans and violence in nature. Days of Abandonment by Elena Ferrante, translated from Italian by Ann Goldstein (Europa Editions, 2005). A dark, slender novel about a woman abandoned by her husband spiraling into terrifying psychological territory, with a helpful dash of absurd humor and redemption. After devouring this book, anything else was VERY difficult to get into. So good. This brief review in The New Yorker is spot on. I have not cracked open her more recent Neapolitan series, but it is definitely on the docket. The End of the Story by Liliana Heker, translated from Spanish by Andrea G. Labinger (Biblioasis, 2012). Another dark novel. I’m sensing a trend? This metafictional work explores Argentina’s Dirty War. I reviewed it for Ploughshares. Death as a Side Effect by Ana Maria Shua, translated from Spanish by Andrea G. Labinger (University of Nebraska Press, 2010). As I note briefly in my review of Heker’s novel, Shua‘s is “dark and wry and screwed up in the best possible dystopian way.” Is it weird to quote myself? Oh well. Dreams and Stones by Magdalena Tulli, translated from Polish by Bill Johnston (Archipelago Books, 2004). I adore Archipelago for focusing on translation and producing truly beautiful books. Dreams and Stones is probably the least dark book on my list, a kind of treatise on cities and imagination. Mile End by Lise Tremblay, translated from French by Gail Scott (Talon Books, 2002). I read this novel a few times, starting in a class in college on literary Montreal. It’s set in the neighborhood I lived in while at McGill, which may be part of my attachment to it. And, yes, yes, this is another dark story, about an obese pianist at a ballet school teetering toward psychosis. The Land of Green Plums by Herta Muller, translated from German by Michael Hoffman (Metropolitan Books, 1996). Muller, winner of the 2009 Nobel Prize in literature, paints a grim picture of life in Romania under Ceausescu. The language is highly poetic, and I’ve been working on an essay about it (among other things) for quite some time. In fact, the assignment I’ve given myself for the next few weeks is to cut that essay up paragraph by paragraph to figure out how to keep going with it. Phew. That’s a lot of recommendations. There are more in my pile. I may write more about them. More likely I will tweet my favorite bits from them in August. But not just August. Probably all year. WITForever! My To-Be-Read Pile. Stay tuned for reviews & more ! Another tasty pile of translated books.